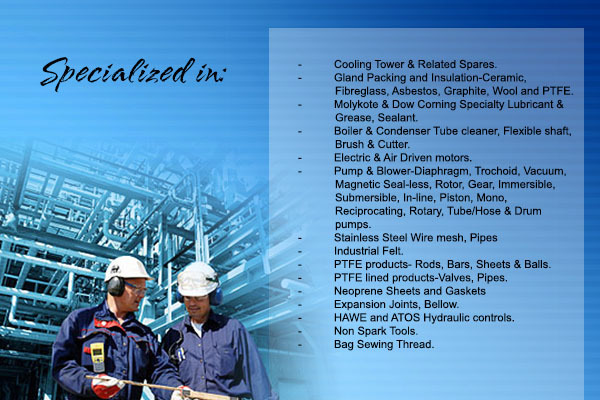 We have become one of the major engineering product suppliers in Malaysia. Our products includes air brakes, air motors, brand name, cam clutches, ceramic blanket, cooling tower & related spares, copaltite, cork sheet, cryogenic valve, cyclo drive sumitomo, dwyer, expansion joints & bellows, gland packings, HAWE hydraulik, industrial wool felt, international paint, loc-line modular hose, lubricating systems, molykote & dow corning specialty lubricants, non sparking tools, omega lubricant, pipe repair bandage, pipe repair clamp, pumps & related spares, rosemount transmitters, rubbers, self lubricating nylon, TEFLON PTFE PVDF products, titanium sheet & rods, trochoid pump, tube cleaning equipments, ventilators (explosion proof), and vibrators. Address: 12, Jalan Bentara 1, Taman Iskandar, 80050 Johor Bahru, Johor, Malaysia.